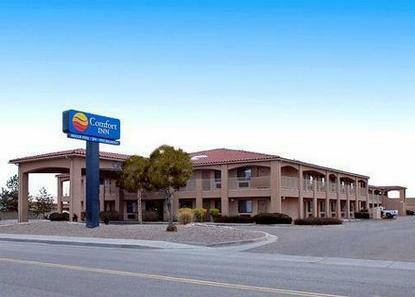 The Comfort Inn West is conveniently located off Interstate 40 with easy access to popular area attractions, including Old Town Albuquerque, the Albuquerque Aquarium, the Indian Pueblo Cultural Center and the Albuquerque International Balloon Fiesta. The Albuquerque International Sunport airport is only 10 miles away. The Albuquerque Convention Center, the University of New Mexico, Kirtland Air Force Base and the Rio Grande Zoo are all within 10 miles of this Albuquerque hotel. There are a variety of movie theaters, museums, an indoor water slide and several shopping centers in the area. Nearby restaurants and cocktail lounges include Denny's, Furr's, McDonald's and Village Inn. Conveniently located off the I-40. Restaurants, shopping center, movie theater nearby. Pool and Spa will be closed for repairs until 08/31/2007.